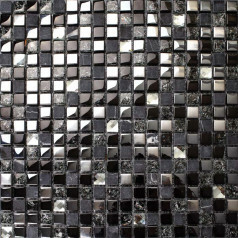 Glass stone tiles both have glittering crystal glass mosaic chips and natural marble stone. 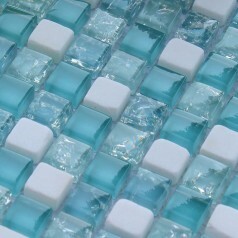 The high-temperature glass chips are stable and durable. The colors will never fade away. 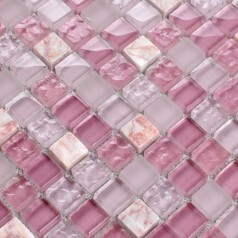 As for the marble chips, the color will not be always same which means the marble chips may have color variation. Some even have wave marks on the finish. However, it is just showing the nature beauty. At Hominter, you will discover beautiful combinations of glass and stone or slate for a unique hard working kitchen backsplash or handsome bathroom wall or backsplash. You will find almost limitless colorful choices in many textures and patterns when you combine slate or stone with our glass tile. 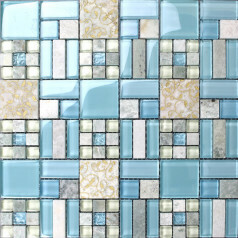 Imagine the elegance you will enjoy when you combine our glossy and frosted glass combined with stone on your backsplash or when you combine squares of shimmering glossy glass tiles with slate around your pool area or unpolished glass tile in a unique shape combined with stone and metal tile on your bathroom shower wall. 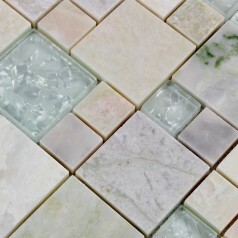 You will find a long list of amazing color and texture variations you can include in your next glass and stone tile project that will showcase your style and make a design statement that will be remembered for years to come. 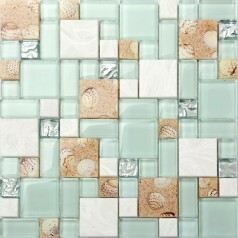 We offer great quality tiles for your home design and remodeling at reasonable prices.